It’s hard to believe that a whole year has gone by – where did it go? 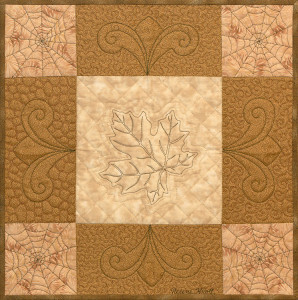 Summer is almost over and Fall will be here before we know it and with Fall comes NW Quilting Expo. Once again, I have been invited to teach and give a trunk show at Expo and I want to take a few moments to give you an overview of the classes I will be offering, the show class brochures have to condense the class description into one paragraph and often that is not enough to cover the class content adequately. Last year, my classes filled fairly well, some better than others but all had enough students that none were cancelled and I hope to keep that up for this year as well. I am offering three classes – two half-day classes and one full-day class and a trunk show/lecture as well. The Trunk Show takes place on Friday September 23 from 10am – 11:45am and will encompass a general sampling of my work over the years starting with some of my earliest pieces and how those led to what I create today. During this journey through fabric and thread (and even a bit of mink) I have explored a far ranging array of styles and techniques that span the globe in their inspirations; it will be a virtual smorgasbord of my work. My full-day class – Free Motion Magic – will be on Wednesday September 21 from 9am – 4pm. This class is well suited for beginners who have never tried free-motion quilting and more experienced quilters alike. 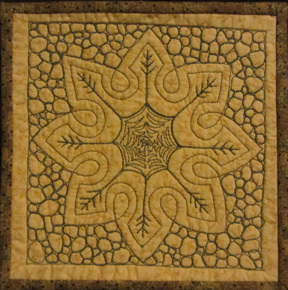 The class will focus primarily on free-motion quilting and will cover a variety of techniques to use for various designs. After this class, you should be able to approach any design you wish to stitch and decide which of the techniques will yield the best results for that design. On Thursday September 22, I will be teaching Man-Doodle-Dalas. You may already be aware of the whole Zentangle® movement that inspires people to doodle, even those who don’t believe they have an artistic bone in their body can learn this ‘stream of consciousness’ style of dancing with a pencil. These free-form doodled mandalas make wonderful motifs for quilting and in the class I will show you a variety of approaches to create and use them. You will learn to doodle your own ‘dalas’ and also receive one of my Man-Doodle-Dalas on a wash away stabilizer to stitch along with a handout with a few other mandala designs (in case doodling your own is not your cup of tea). This class will run from 9am – noon. Free-style Medallion stitched without a template. On Friday September 23 from 1pm- 4pm I will be offering Simple Sashiko Landscapes. This is the class I’m most excited about. I learned to hand embroider as a child then abandoned that in favor of quilting for much of my adult life but I have rekindled the passion for hand stitchery in recent years. 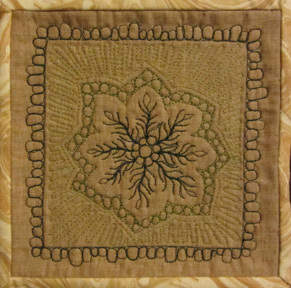 My love for embroidery, like my love of quilting, spans a world of techniques – mostly ethnic. 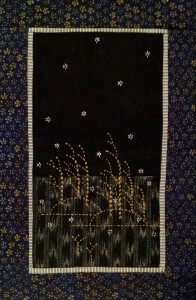 Years ago I discovered Sashiko (Japanese Hand Stitching) which I took to like a fish to water. Many of you may have been hearing lately about a rather new stitching fad called ‘Slow Stitching’. Well, it’s not really new at all, anyone who has explored Scandinavian Darning, Indian Kantha or Japanese Sashiko, knows this meditative sewing technique has been practiced for centuries. What’s new is old and what’s old is new. 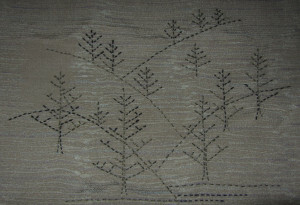 What’s new in this Sashiko class is the subject matter for the stitching. Sashiko is usually applied to a wide variety of traditional Japanese designs ranging from all-over patterns to Komon (Japanese clan crests). In this class you will apply this slow stitching technique to creating little stylized landscape vignettes. There will be a couple of designs included in your handout with a variety of interchangeable tree designs in case you want to customize your own scene. I do hope you will come join me for one of more of these classes and/or the trunk show, I promise you will leave the event with new skills in your repertoire or at least inspired to explore and take your own quilting to new heights. 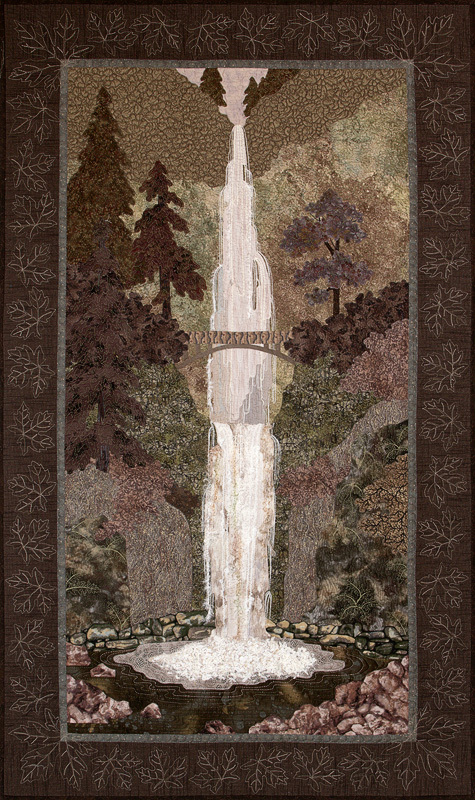 PS: Here is a sneak peek at my NW Quilting Expo show entry – Vintage Falls. It is yet another rendering of my Multnomah Falls pattern this time in Japanese Taupe fabrics (I LOVE those Japanese Taupes!) My goal was the try and recreate the image in a sepia tone presentation just like one of those old time photographs. It is hand and raw-edged machine appliqued with some textural embellishment. The photo does not do it justice – you need to come to the show and see it in person.